REGISTRATION IS NOW OPEN FOR LEGISLATIVE DAY 2019! Please call the HHNC office at 919-258-8685 and speak to Greg (or email gkirkpatrick@habitatnc.org) in order to volunteer to make that day a huge success in terms of turnout and impact. Sustain & Increase Public Financing. 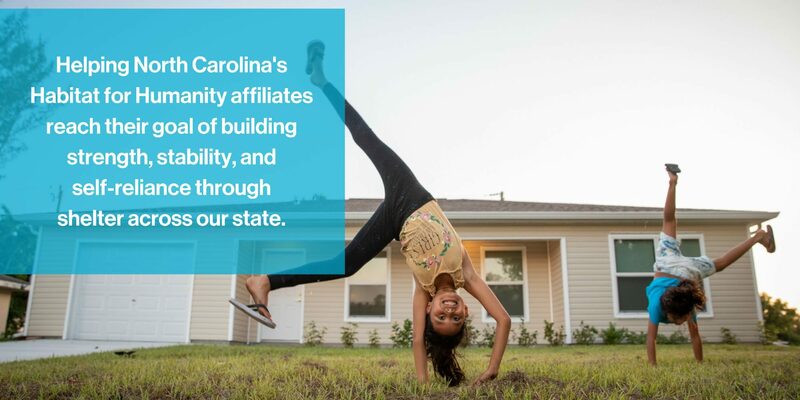 Habitat affiliates benefit greatly from funding and other public financing made available to them through the NC Housing Finance Agency. This support is absolutely vital if Habitat is going to continue to build and renovate housing for people with few other options. Our focus will be not only on maintaining the level of funding in the NC Housing Trust Fund, but also to attempt to increase the level of public financing for home construction and infrastructure for neighborhoods. Maintain the ban on Predatory Lending. We have worked closely with the Center for Responsible Lending on ensuring that North Carolina continues to be a leader in disallowing harmful lending practices that put our prospective and existing homeowners at risk. With the pending CFPB ruling on payday lending nationally, we need North Carolinians to work to keep payday lending out of North Carolina altogether. Every year, Habitat NC participates in Habitat on the Hill, an event in which Habitat representatives from across the country descend on Washington, DC to meet with lawmakers. Stay tuned for more information on this event in 2019.